Very cute and pleased with the end product. Every year I purchase a different ornament for each of my grandchildren. 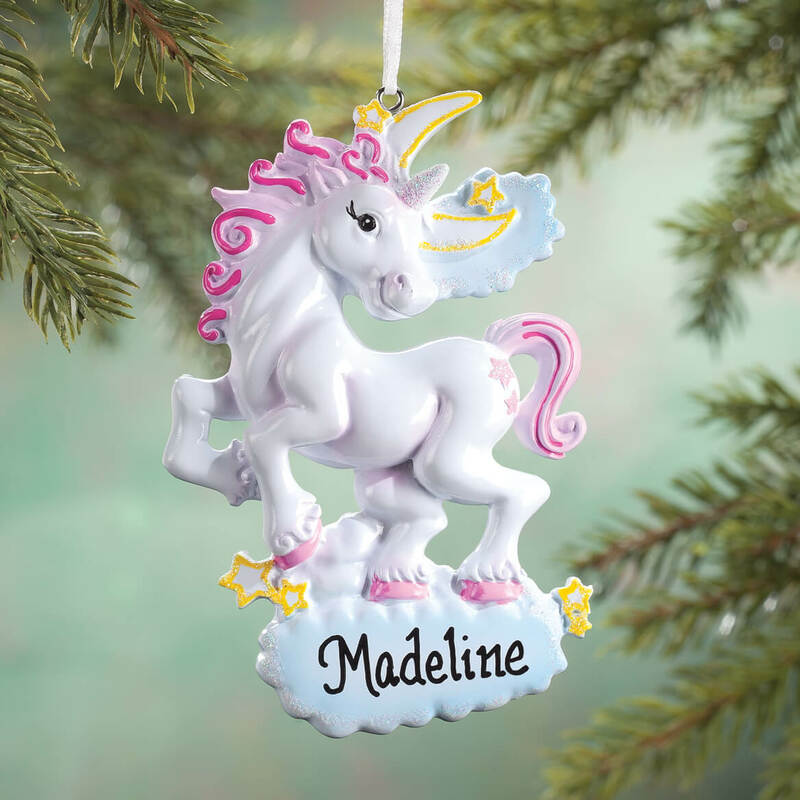 Since my 4 year old granddaughter is heavily into Unicorns this year, this will be a big hit with her; especially personalized with her name. It is very solid and detailed. I buy different Christmas ornaments for my grandchildren every year. I always return to Miles Kimball for these ornaments. They are great quality and have a huge selection to pick from and are larger then they appear online. This specific one is for our granddaughter who is 9 and loves unicorns. Purchased for 4 yr old granddaughter for Christmas. Very cute, with personalization. Great choice for a unicorn loving little girl! Love this ornament. So adorable with the personalization. Love this unicorn! The colors are brilliant! Can't wait to give it to my granddaughter for Christmas... Its so Adorable! Gave it to my granddaughter.she loves unicorns and she wants to hang it in her room and not on the tree . This is a great ornament. My granddaughter loves it on her Christmas tree. It is so beautiful. This ornament is cute, it will be a Christmas present for our granddaughter. bought it for daughter for Christmas, she loved it. Got this for a grand niece, I think she will love it for Christmas with her name on it. The ornament was ok. Just not what I was expecting. The ornament was ok. The writing of the name was very nice and well done. Unfortunately it areiv d after Christmas. But I don't think that was your fault as the weather from there to CA was very bad at the time and transportation was hindered!! I have a new granddaughter and it was adorable. Granddaughter loves unicorns so this is perfect. I have a granddaughter who loves Unicorns. This Unicorn is adorable and it allows for 10 letters. Our granddaughter has 10 letters in her name and most ornaments only allow 8. This is absolutely perfect .She loves Unicorns!! Perfect for a little girl whose room (and Mother!) love unicorns! My great granddaughter loves unicorns. It's so cute and I know she will love it! For.the design, color, and because it was whimsical. You had exactly what I was looking for! Granddaughter Christmas ornament. She loves unicorns. Because it is very cute. Christmas ornament for my granddaughter. She loves unicorns and I was able to personalize it with her name. I just wish I had a little bit more room to add 2018 as well as her name. They are beautiful & my granddaughters love these. Young lady we "borrow" as daughter we never had loves unicorns. My granddaughter really likes unicorns hope this makes her smile. Keepsake for my 4 yr old granddaughter who likes Unicorns. So my daughter can have her own ornament to hang on tree. 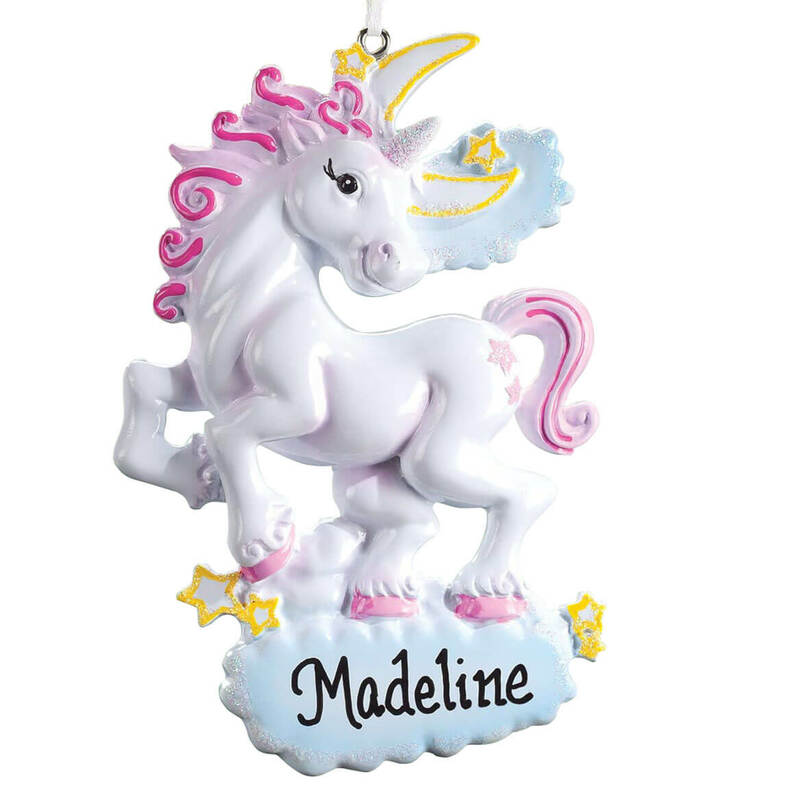 My granddaughter loves unicorns and I was excited to find one that I could personalize. Child wanted a unicorn theme party. Where do you put the year? BEST ANSWER: My great-granddaughter loves Unicorns so I had to get this for her. I decided to put the date on the back, along with, "Love Nana" with a Sharpie pen. I, always look for ornaments with the the date included, but I had to make an exception this time. Thank you for your question. That will depend on the length of the name. If if it is too long it will not be able to fit the year. We hope this information will be of help to you. I did not have a year put on this ornament. Maybe if you needed one it could be put on like this, '18.